Q: It is reported the DPRK launched an intercontinental ballistic missile this morning. What are the comments of the Chinese side? A: We have taken note of relevant reports. We are trying to get more information on the launch and are closely following the developments of the situation. We have stated China's position on the relevant issue many times. Relevant resolutions of the UN Security Council have explicit stipulations on launches conducted by the DPRK using ballistic missile technology. 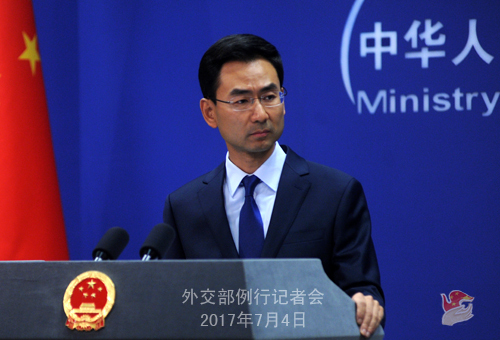 The Chinese side opposes launches by the DPRK in violation of relevant resolutions of the UN Security Council. The Chinese side urges the DPRK not to violate relevant Security Council resolutions any more and create necessary conditions for the resumption of dialogue and negotiation. I would like to reiterate that the situation on the Korean Peninsula remains highly sensitive and complex. We hope all relevant parties can stay calm and exercise restraint, ease tensions on the Korean Peninsula as soon as possible and bring the Korean Peninsula issue back to the right track of peaceful talks at an early date. Q: Following the DPRK’s missile launch, US President Donald Trump tweeted that Perhaps China will “put a heavy move” on the DPRK and end this nonsense once and for all. What’s your response to his remarks? Do you think President Trump is pressuring Beijing? Will China consider taking a “heavy move” against the DPRK as President Trump said? A: As I said just now, we oppose any action in violation of the Security Council’s resolutions. I won’t repeat China’s stance on the Korean Peninsula issue as it is clear enough. I shall stress once again that in a bid to solve the Korean Peninsula nuclear issue, China’s contributions are there for all to see and its role is indispensable. China has been making and will continue to make efforts in this regard, and we hope other parties will do the same. We hope that various parties can work for the shared goal and jointly bring the Korean Peninsula nuclear issue back to the right track of peaceful settlement through dialogue and negotiation at an early date. Q: Yesterday a Sri Lankan government minister said that US$ 500 million from a loan that China had given for the Hambantota port deal had vanished and it is unclear where the money is. Can you tell us how much money did the Chinese government loan for the Hambantota port deal? Was it US$ 1.4 billion or US$ 900 million? Has the Chinese government been in contact with the Sri Lankan government about this US$ 500 million that the Sri Lankan government has so far been unable to account for? A: I am not aware of what you said, and I will refer you to relevant department or enterprise. What I can tell you is that the Hambantota port project is negotiated and conducted by the Chinese enterprise with the Sri Lankan side in accordance with market rules. Over recent years, the pragmatic cooperation between China and Sri Lanka in various fields has continuously deepened. The Chinese side has, on the basis of mutual respect and treating each other as equals, provided loans and other assistance within its capacity for infrastructure construction in Sri Lanka and striven to promote its socio-economic development. Q: China has assumed the rotating presidency of the UN Security Council for July. Can you brief us on China’s work plan during its tenure? A: China has taken over the rotating Security Council presidency for this month. On July 3, China's Permanent Representative to the UN, Ambassador Liu Jieyi, chaired a consultation at the Security Council, during which the work plan for this month was approved through discussion. 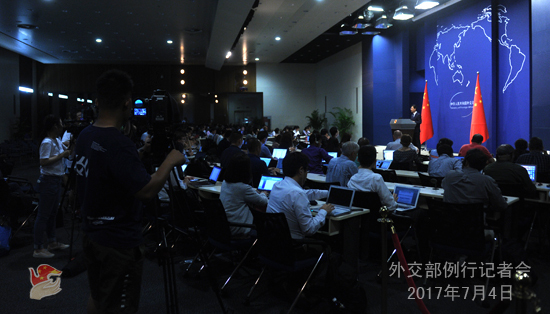 Chinese and foreign media were informed of relevant work arrangements after the consultation. The Security Council will hold around 30 meetings in July to review Middle East issues including Syria, Yemen, Iraq and Lebanon, African issues including South Sudan, the Democratic Republic of the Congo, Burundi, the work of the United Nations Office for West Africa and the Sahel (UNOWAS), Latin American issues including Columbia and Haiti, and the Cyprus issue. Resolutions are expected to be adopted to extend the mandate of the UN Peacekeeping Force in Cyprus and the UN Assistance Mission in Iraq and deploy a second UN Mission in Colombia. The Security Council will hold two open debates in July. One is on capacity building in Africa to maintain peace and security, with a view to offering support to Africa’s capacity building for peace and security. The other is on the Middle East issue. With the Israel-Palestine issue in focus, it will try to form synergy among parties and create enabling conditions for the return of Palestine and Israel to the track of negotiation and an early materialization of the two-state solution. As a permanent member of the Security Council, China has always committed itself to helping the Security Council maintain solidarity and coordination, take vigorous actions and play a key role in stopping war and upholding peace in the spirit of the UN Charter. We will earnestly perform our duty as President of the Security Council, stay in close communication and coordination with other members of the Security Council, and make its work more practical and efficient. At the same time, we will reinforce our interactions with non-member countries, countries directly concerned and the UN general assembly, solicit opinions and advice widely and fulfill the responsibility of the Security Council President in a more open and transparent manner. Q: In his letter to Kuwait’s emir on July 3, Qatar’s emir gave an official reply to the conditions for reconciliation put up by Saudi Arabia and other countries. Preceding that, the leaders of Russia and the US made phone calls with their counterparts in Qatar, Saudi Arabia and the United Arab Emirates to reaffirm the settlement of the crisis through dialogue and diplomatic channels. How do you comment on that? 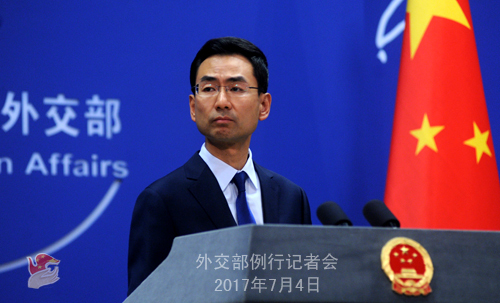 A: China hopes that relevant parties can properly solve the differences through dialogue and negotiation within the framework of Gulf states. We support all efforts conducive to the recovery of stability in the Gulf region including the mediation by Kuwait, and we believe the Arab states can find a solution to the particular issue that can be accepted by all. Q: On the case of Zhang Yingying, does the Ministry of Foreign Affairs have any comment on the way that the case is being handled in the US? A: We have been closely following the developments of the case and also noted the trial yesterday. We are deeply shocked and saddened by this tragedy, express strong indignation at and condemnation to the cruelties of the perpetrator, and convey deep condolences to the families of Zhang Yingying. The Chinese government attaches great importance to protecting the security and legal rights and interests of the overseas Chinese citizens. The Ministry of Foreign Affairs and the Chinese diplomatic missions in the US will continue to follow the case, stay in close communication with the US side and coordinate with the US police to speed up all-out efforts for search and investigation. We urge the US judicial department to hear this case impartially in accordance with the law, hold the perpetrator accountable and uphold justice. We will continue to provide assistance to the families of Zhang Yingying in handling relevant affairs in the US.